The Funding Practice Alliance in collaboration with Mthente Research and Consulting Services conducted a research study on civil society in South Africa to better understand how the civil society sector is funded, and how it advances South African society through contributing to employment and to the economy. Completed in 2016, this document provides a summative overview of the research study. • The majority of South African CSOs are ‘Micro’ to ‘Small’ and newly established, with an annual income of less than R500,000. 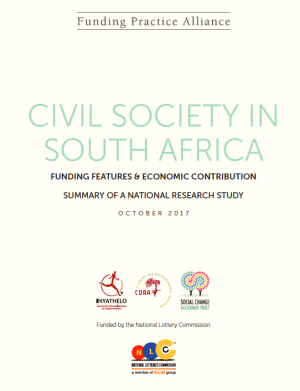 • International sources contributed the largest portion of total funds to CSOs in 2014 (40%), followed by the SA government (24%), and local citizenry (23%). • The vast majority of South African CSOs (96.9% of the sample size) do their fundraising internally and don’t employ a professional fundraiser. • Social Services received the majority of funds in 2014 (36%), followed by Health (27%) and Development & Housing (18%). A number of themes emerged during the course of this study, especially in relation to funding and staffing. Amidst increasing registration of new NPOs, and decreasing International funds, there will be more pressure on Government sources to contribute greater a proportion of their annual budgets. The very nature of the "typical" South African CSO raises issues as well. Many CSOs are newly established and small in terms of both employees and income. Oftentimes these smaller CSOs lack the staff trained with requisite skills needed by the organization to remain sustainable. Funding should therefore be accompanied by capacity building; and the two should not occur in isolation from one another. • If Social Services receive the majority of funding, what does this mean for the role of the state in providing such services? • What does the fact that international sources of funding are higher than domestic sources say about the state of philanthropy in SA? • In regard to the concentration of CSOs in urban centres, what is the effect on grant making to CSOs in ‘needier’ provinces? • What is the role of volunteers/unpaid staff in civil society? • How should the civil society sector be defined and categorised for the purpose of producing meaningful and disaggregated statistics related to funding? • How can the emerging body of research on funding sources and flows best be shared, and how might collective engagement be enhanced in the setting of future research agendas? • How should the sector’s economic and social contribution best be understood and measured? The full report summary is available to download from the FPA website. * The estimate is based on the assumption that 35% of 132,773 South African registered NPOs are active, and then using the study’s sample average number of employees to project the likely population employment contribution.